When we moved in we had only a small white table and two chairs but a massive kitchen. It took me some time but then I found the perfect huge table at a market and brought it back home. It didn’t have exactly the dark colour I wanted to I revamped it a bit. We also had a garden bench, which will stay in the kitchen.until we find a new one that fits better (which is hard because it should be at least 1.80m long and not expensive). Now we needed chairs. And sometimes I can be very patient. In Germany every now and then you can place your bulky waste on the street and will be taken away. And many people place totally good and usuable furniture there. The first two chairs I found on the street back in 2011. It took some time but then I painted, repadded and covered them with new cloth showing the map of London. I used this cloth for three reasons: 1. it matched with the colours I was using. 2. It was the right strong quality you need for chairs and 3. it is always fun, to check the map as Michael’s brother is living in London and we can have a chat on where to go, when we go to visit the next time. But as I said, the table is big. We needed more chairs. This spring I finally found two basic IKEA chairs on the street that got repainted as well. And I found a little beauty, but very damaged. The seating was made of canning and was torn, the original colour screamed: “put me in an conservative old lady’s room”. It was made for the trash. But I “adopted” it. It took some time (I’m not always in a handicraft mood) but then, I painted it light green and gave it a new cushions seating. 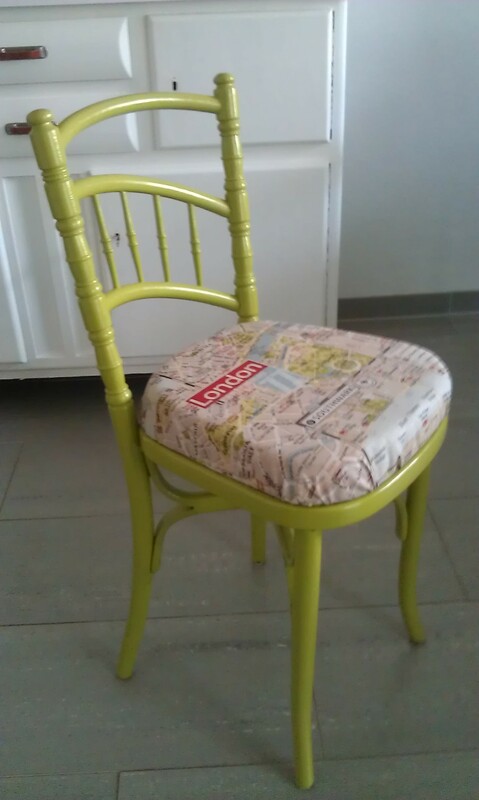 Now it is the most fun chair in the kitchen. But the others fit as well. They are all some shade of green, to match and I love them. And when it comes to money, well, I haven’t bought any of them. But for the money that I spend on restoring them, I might have gotten new chairs. But definitively not with such character. 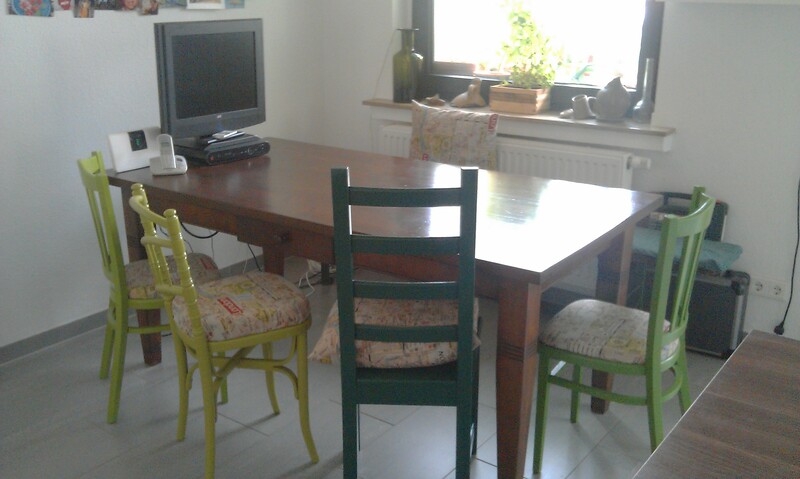 This entry was posted in At home, Furniture and tagged Chairs, Repair, Upcycle by kathatravelling. Bookmark the permalink.